RUSH: Right before the program started today, mere moments ago, the president’s new legal immigration plan was outlined, Senators Cotton and Perdue, Cotton from Arkansas, Perdue from Georgia, announced Trump’s new immigration proposal. And again, this is legal immigration. And, folks, the Democrats and the media are having a daily conniption fit. They are beside themselves today because Trump’s immigration program is merit-based, English language is preferred, exactly like Canada has, by the way, exactly like New Zealand and Australia and many other countries that the left hail as enlightened, and, in fact, much the way our legal immigration used to be. It wasn’t that long ago that you had to learn to speak English. We didn’t bifurcate cultures or any of that. You had to learn to speak English and you had to love America and you had to learn how to do this if you wanted to become a citizen. But all of that has been watered down. And Trump is trying to get back to that. The left is going insane over these points, and the Drive-Bys are doing the same thing. Now, this announcement seems to be in line with what a lot of people have been suggesting that Trump do and that is lay out one agenda item, one issue every day to try to control the media narrative. I’ll give you an example of the media narrative. I want to go through a list of things that were big last week but are not as big this week. And the way to look at this is this is why you ought to pay scant attention to any of this. And this is just off the top of my head. Last week these items were dominating the news at a frenzied pace. Last week these items, it was crisis, it was chaos, it was intense. The Jeff Sessions supposed firing. The Jeff Sessions put-downs by Trump. Donald Trump Jr. and his meeting that everybody thought represented collusion with the Russians. Kushner’s testimony. Pence gearing up to be president in advance of Trump being sent packing. Priebus leaving, White House intrigue. Russia and Trump trying to screw Hillary out of the Oval Office. That story never goes away, but it’s beginning to fade. Last week those are the big items, and now this week Trump’s trying to change the narrative with his immigration, legal. This is not the illegal, comprehensive illegal immigration reform. This is a reform of legal immigration. Merit-based is what has the left in a tizzy. And of course the English language is preferred. To them, merit-based is discriminatory. Merit-based is insulting. And the reason for that is that not everybody will qualify if it’s merit-based. That’s kind of the definition of it. It’s rooted in wanting the best and the brightest and the most qualified, which exactly should be our requirements! It’s our country! It’s not a welfare state. It’s not meant to be the drain for the rest of the sewer that is the world. But that’s how the left wants to look at it and see it. Because they position everything as everybody in the world is a victim, including many of the people that live here. And the reason for that is the more victims, the more need there is for Washington to take care of them and to save lives. So I don’t know how long this is gonna dominate the cycle, but it’s out there now. It probably doesn’t have a chance in the Senate because none of the Trump agenda seems to have an advance chance in the Senate. RUSH: I didn’t see the entire immigration announcement. I had to be doing some other things at that particular time, so I don’t know if this point was made. But, you know, the United States, we are already by far the most open country in the world to legal immigrants. And, hell, to illegal immigrants too. We are by far the most open country. I mean, it isn’t even close. We accept more legal immigrants every year than the rest of the world combined, folks. Now, stop and think about that, and then compare that to all of this tripe that you hear from the media and the left about how “punitive and discriminatory” the United States is. And how “restrictive” we are and how we’re “not inclusive.” And we run rings around the rest of the world in just discussing legal immigration. In recent years, you know what the number has been? It has topped 1.7 million a year legal immigrants. That’s something you would never know if all you did was listen to the Drive-By Media. They would have you believe that we hate immigrants and that we keep them out and that that’s why we must have sanctuary cities and that’s why we must have illegal immigration because the U.S. is so exclusive. And it’s all a bunch of tripe. Now, some of the details on the immigration bill that Trump is pushing today — this is via the AP. “The White House said that only 1 in 15 immigrants comes to the U.S. because of their skills, and the current system fails to place a priority on highly skilled immigrants,” and they want to change that. Look, I’ve got another break coming up here. I want to run through some of this, though, because it’s gonna be the only place you’re gonna get the truth about the intent here. Of course, you can’t escape climate change, no matter where you go in the world. You understand that? There’s nowhere to go to escape climate change. Yeah, they’ve kinda boxed themselves in a corner on that one. What else does it say here? “Perdue and Cotton introduced the legislation in February that would change the 1965 law to reduce the number of legal immigrants, limiting the number of people able to obtain green cards to join families already in the United States.” Chain immigration. That’s one of the objectives here. But, now, we’re still dealing with an immigration law from 1965, in case you didn’t know. Perdue and Cotton introduced this bill in February and nobody’s paying any attention to it, which is one of the reasons for the White House announcement today, is to try to call some attention to this. “The bill would also aim to slash the number of refugees in half and eliminate a program that provides visas to countries with low rates of immigration.” The reason Trump did this at the White House… ‘Cause this is not a Trump legislative effort. It is a Senate legislative effort. Sonny Perdue and Tom Cotton. Trump’s appearance was aimed at bringing attention to this, which… Well, it’s been largely ignored in the Senate. There haven’t been any cosponsors. Republican leaders have showed no inclination to vote on immigration this year. They don’t seem to have shown any inclination to vote on anything this year. Seems like it’s pulling teeth. So let’s go to the audio sound bites. Hear up first is Trump. This is at the White House and it’s about 45 minutes ago. THE PRESIDENT: Among those hit the hardest in recent years have been immigrants — and very importantly minority workers — competing for jobs against brand-new arrivals, and it has not been fair to our people, to our citizens, to our workers. The RAISE Act ends chain migration and replaces our low-skilled system with a new points-based system for receiving a green card. This competitive application process will favor applicants who can speak English, financially support themselves and their families, and demonstrate skills that will contribute to our economy. The RAISE Act prevents new migrants and new immigrants from collecting welfare. RUSH: Well, I mean, every bit of that is a call to arms for the Democrat Party and the media and the American left. Let’s unpack this, as they say. The RAISE Act “ends chain migration.” Democrats hate that, ’cause that’s automatic Democrat voter registration, to them. “Replaces our low-skill system…” Democrats need a low-skill, low-intellect, low-ambition, low-everything… That’s who Democrats want. They need wards of the state. They need people who are gonna end up being a permanent underclass. Trump wants to eliminate a great number of those people and instead wants a new points-based or merit-based system for getting a green card. 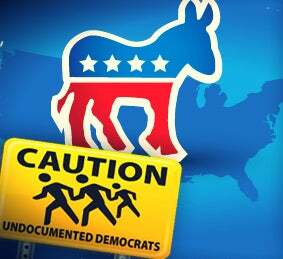 It would be competitive, and it would “favor applicants who can speak English, who can financially support themselves and their families, and demonstrate skills that will contribute to our economy.” Now, I think, folks, it is quite illustrative that those three things are going to be the primary reason why the Democrat Party opposes this. And yet, all three of those things are paramount common sense. They’re not just common sense, they are brilliant sense. If we are going… We want a great country. We want the people in the country to be able to do great things. We are in charge of who gets into this country. We do not exist as the welfare state of the world. Our purpose in the world is quite different. But the Democrat Party and the media — the American left — indeed wants this country to be the welfare state of the world. They want the United States to be where anybody downtrodden and what have you is automatically admitted. And it’s for purely political reasons. It’s rooted in the belief that everybody’s a victim and that everybody’s helpless and that everybody’s life is threatened. In every liberal Democrat cause — I don’t care if it’s climate change, health care, or what have you — they position themselves as being the people who will save lives. “Health care will save lives. Republicans will kill people.” See how it works? “Our climate change policies will save lives. The deniers and people that don’t believe it don’t care if people die.” This is how this stuff is all structured, and it’s entirely fraudulent and bogus. We want to run the country the way most people run their lives, and you don’t accept the neighborhood in your backyard and assume it’s your responsibility to care for them. Most people think that everybody in the neighborhood — everybody else — ought to be self-reliant. That’s just the way we are, and we ought to apply that to our immigration policy. It makes perfect sense that we would want people to speak English who can support themselves and their families and demonstrate skills that will contribute to the economy. It’s no different than our foreign aid policy, what it ought to be. Why should we give money to countries that hate us? Why should we give money to countries that try to undermine us? Why should we help countries that ally and partner with our enemies? It ought to be just the opposite. It ought to be tough to get foreign aid, and countries that want it ought to have to demonstrate that they love and respect the United States and are working with us. It’s only common sense. To the left, though, that is “exclusionary” and it’s “discriminatory.” And then that last line: “The RAISE Act prevents new migrants and new immigrants from collecting welfare.” Well, that’s the whole reason the Democrat Party wants ’em. So this is going to be a massive fight. Here’s the second sound bite from Trump. THE PRESIDENT: Crucially, green card reforms in the RAISE Act will give American workers a pay raise by reducing unskilled immigration. This legislation will not only restore our competitive edge in the twenty-first century, but it will restore the sacred bonds of trust between America and its citizens. This legislation demonstrates our compassion for struggling American families who deserve an immigration system that puts their needs first and that puts America first. Finally, the reforms in the RAISE Act will help ensure that newcomers to our wonderful country will be assimilated, will succeed, and will achieve the American dream. RUSH: Whoa! Whoa! Did you hear that? He used the word “assimilated.” You don’t hear that in immigration anymore. “Assimilation? Why, that’s discriminatory! Why should immigrants have to have the American way of life forced on them?” That’s what the left says. That’s right. The American way of life is an imposition, don’t you know? Yes, we have forced — we have imposed — our way of life on people around the world against their wishes. And we now want to impose our way of life on immigrants. Who the hell do we think we are? That’s their attitude. But assimilation has always been the key to immigration. Again, I want to remind people, immigration, legal immigration in the United States stopped in the mid-1920s and was not resumed until 1965, with the Immigration Act of that year. Do you know why? Because there had been a flood of immigrants in late 1800s throughout the early 1900s, and we had to assimilate them. Now, it was easy because they wanted to become Americans. They came from all over the world and wanted to be Americans. But it still takes time to assimilate to a new culture, to learn English as your predominant language. We didn’t have any legal immigration for all of those years, mid-twenties to 1965. Every time I tell people that and they don’t know it, they’re shocked. Can’t believe it. It was Senator Kennedy and the Democrat Party that realized the political need for downtrodden, economically lower-class people for their future needs. It was a little hint that FDR gave them way back during the New Deal.